In the wake of President Kennedy’s pressure, a new name was suggested, apparently to Lyndon Johnson by Senator Kerr and independently to President Kennedy by Wiesner. Wiesner later argued that his suggestion was the one that was decisive, although other accounts suggest that it was Lyndon Johnson who first brought Webb’s name to White House attention. The new candidate was James E. Webb, a businessman and lawyer with prior experience in high-level government posts. During the Truman administra­tion, Webb had been head of the Bureau of the Budget (BOB) and then the number two person under Dean Acheson at the Department of State. Webb also had experience in managing large organizations; he had worked in Oklahoma heading one of Robert Kerr’s companies from 1953 to 1958. After leaving Kerr’s employ, Webb had been active on issues of science and engineering education, in the process becoming well known to many of the leaders of the scientific community, including Wiesner. According to Wiesner, Kennedy asked him to check whether Johnson agreed that Webb would be a good choice. Johnson did agree, and because he had had such little success with the people he had contacted, asked Wiesner to call Webb. On Friday, January 27, after clearing the contact with the presi­dent, Wiesner telephoned Webb, who was at a luncheon in Oklahoma City, and asked him to be in Washington the following Monday to meet with the vice president to discuss the NASA position. Before meeting with Lyndon Johnson (whom he did not know well), Webb chatted with acting NASA administrator Hugh Dryden, who was there for the meeting, and Frank Pace, who had been Webb’s successor as director of the BOB in the Truman administration. Webb had also known Dryden since the late 1940s. Both Pace and Dryden agreed with Webb that he was not the right man for the job, and Webb asked Pace to convey that view to Johnson. Pace tried to do so, but Johnson was unwilling to listen and in essence threw Pace out of his office. Webb then met with Johnson, who, Webb says, was “very anxious” for Webb to accept the NASA job. Webb made it clear that he would only accept the position on the basis of a direct offer from the president. Arrangements were quickly made for Webb to meet with Kennedy, whom Webb previously had met only once or twice on social occasions. 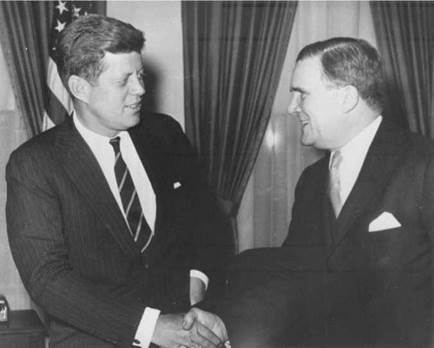 After lunch with Dryden, Webb met with Kennedy one-on-one in the Oval Office. Kennedy told him that he did not want a technical person for the NASA job, saying that “there are great issues of national and interna­tional policy” related to NASA, and that Webb, with his previous govern­ment experience, was well qualified to address such issues. Webb felt he could not refuse the president’s direct invitation, and so accepted the nomination. President Kennedy and James Webb on January 30, 1961, as Webb accepted the president’s offer to become the second NASA administrator (JFK Library photograph). 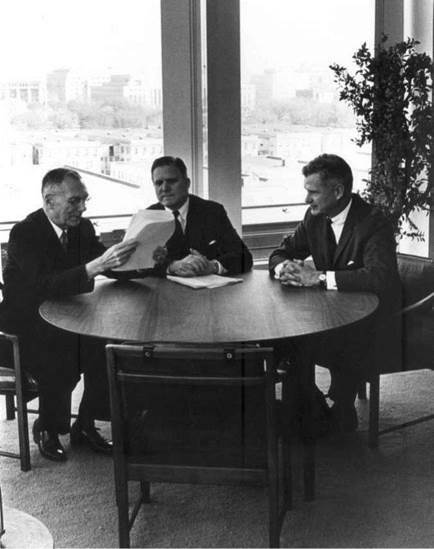 The “triad” of men who managed NASA during the Kennedy administration: Deputy Administrator Hugh Dryden (left); Administrator James Webb (center); and Associate Administrator Robert Seamans, Jr. (left) (NASA photograph).